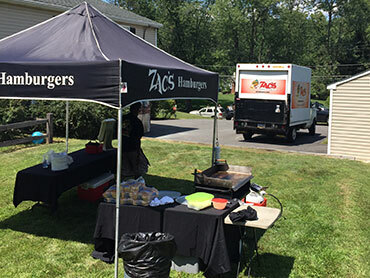 Zac’s offers fun, easy, and cost-effective tent & grill catering for events and parties throughout the PA-NJ-DE tri-state area. The next time you are hosting a party whether at home or in the office, don’t stress over doing all the work yourself. Why exhaust yourself before your guests even get there? 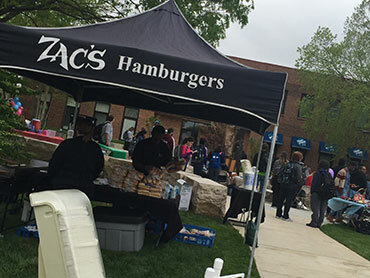 Zac’s Hamburgers can help with their burger catering. Let us do all the cooking and prep so you can just enjoy your time with your guests instead of running around all over the place. And you know your guests will be pleased because who doesn’t enjoy a good burger? From hand-dipped milkshakes to lip-smacking burgers and fries, Zac’s Hamburgers catering in Delaware County, PA offers something for every member of the family. We also offer catering in Philadelphia as well. We will come to you. All of our foods are made to order to guarantee you the freshest flavor with every bite. Additionally, we are always adding new dishes to tantalize your taste buds. We are dedicated to keeping you well-fed and happy. Come in today to sample our delicious chicken wings, available in mild, hot, BBQ, and honey soy garlic. You can also view our complete lunch and dinner menus online. You will notice that we offer something for even the pickiest of eaters. At Zac’s, we have mastered the art of catering hamburgers and we would love to help you with your event. 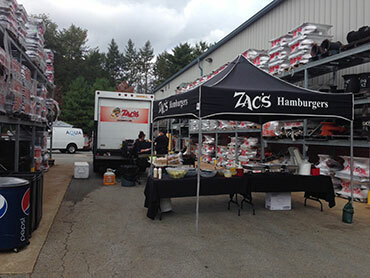 At Zac’s, we have mastered the art of catering hamburgers and we would love to help you with your event! With our versatile menu, we are sure to have something to please everyone. With grilled chicken and fresh salads and fruit, even your guests who don’t eat red meat and are looking for lower calorie options will be able to find something to eat. Choose our hamburger catering, for some homemade delicious food that will be the hit of the party. No one will leave hungry. Being the perfect host or hostess has never been easier when you have Zac’s Hamburgers on your team. Click Here for our store menu! 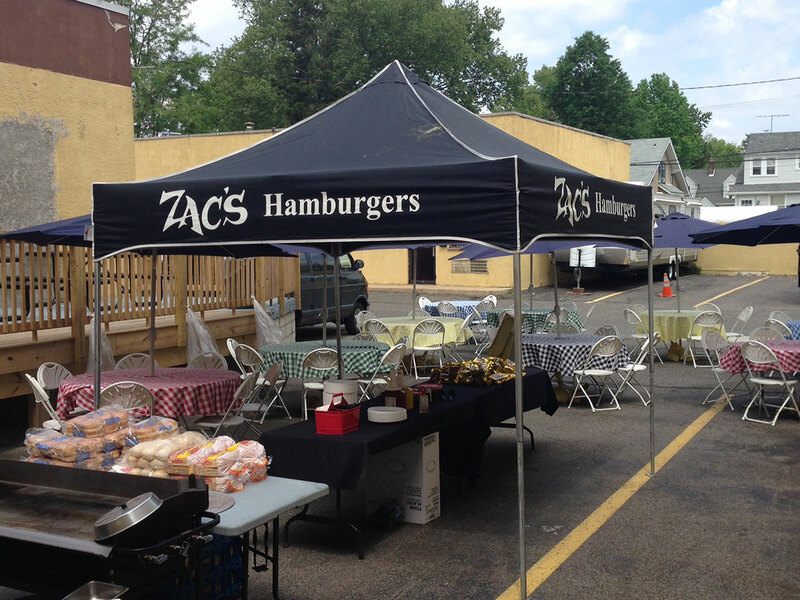 Contact us for more information on how to reserve a Zac’s Tent & Grill Party Package for your next event. Submit the form below or call 610-532-6766. We also provide an array of tasty side dishes and salads to complement the meal, along with all the necessary utensils and condiments. We will bring everything you need so you don’t have to spend hours shopping and cooking. Why be stressed when you don’t have to be? Let Zac’s cater your next party while you sit back and enjoy the festivities with your guests. If you are looking for private party catering that offers you affordable prices and delicious food, then you have come to the right place. At Zac’s Hamburgers, we pride ourselves on providing mouthwatering meals and top notch service for our burger catering. Our name is synonymous with good food. Zac’s is known for burger catering, but did you know we can also cater your barbecue? Outdoor parties can be a lot of fun in the warmer weather when you can enjoy the warmth of the sun beating down on you as you make memories with family and friends. And what says warm weather louder than a barbecue? At Zac’s Hamburgers, we offer BBQ catering in Delaware County, PA and BBQ catering in Philadelphia, PA. You can get our delicious hamburgers, veggie burgers and wings in the comfort of your own backyard. Why miss all the fun while you are standing at the grill cooking for everybody, when we can do it for you while you hang out and fun. Get everyone dancing or get up a game of baseball. Take advantage of the fresh air while you can without having to worry about prepping and cleanup. What can be better than that? Choose Zac’s backyard BBQ catering for your next barbecue you host and you will love how everyone raves about the food and service. All the sides are homemade and all the burgers, chicken and hot dogs are grilled to order. You will be able to sit back and accept all the praise without having to lift a finger. Who says all corporate events have to be formal and stuffy? You don’t want to throw a cookie cutter party where it is the same old food and atmosphere. The sky is really the limit when it comes to planning the perfect corporate event. Burgers and wings are fun, comfort food that everyone will love. When you choose Zac’s burger catering for your cooperate events, you will feel confident that your employees and clients will truly enjoy themselves. No one will be slipping out early at this party, that’s for sure. Holding an employee barbecue is a great way to say thank you to them for all their support and hard work. It offers an informal and fun atmosphere for everyone to relax and just bond together. It can be a great way to strengthen relationships so everyone feels part of the team. We offer corporate catering in Delaware County, PA as well as corporate catering in Philadelphia. Have you noticed more and more food trucks popping up at events you attend? The food truck trend is still going strong and people are loving the unique stamp a food truck or trucks put on their event. A food truck can bring a casual, fun vibe to your event, avoiding that stuffy feeling that a lot of formal events tend to have. Food Truck weddings, in particular, have become really popular for brides and grooms who want to offer their guests a unique culinary experience. 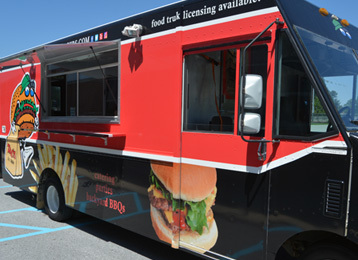 At Zac’s Burgers, we offer food truck catering services in Delaware County, PA and the Philadelphia area. From the convenience of our food trucks, you can still enjoy our signature burgers and wings and other delicious favorites like veggie burgers, grilled chicken and hot dogs. We also make fresh side dishes to complement the main dish. 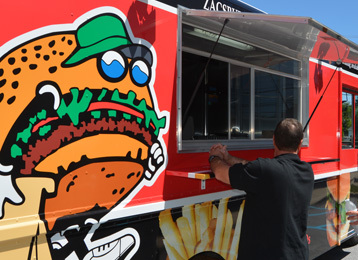 Enjoy your event more by having less setup and clean up with Zac’s Burgers Food Truck Catering.